Weekend Assignment #170: Share a useful tip for the kitchen. It can be about anything from cooking to cleaning, as long as it involves something in the kitchen (which, for the purposes of this assignment, includes the pantry and the table you eat at). I Love to cook – no really I do, and I’ll take any opportunity to get in the Kitchen and make something great. I love to invite people over for dinner and then cook them up something more then the standard meat n veg – I even go so far as to make courses of food and many dishes with different flavours and tastes. This way people can have different tastes and amounts to their liking. So I guess what my tip is for the kitchen is to be open and create something. Don’t just have one flavour or style of meal, mix and match. 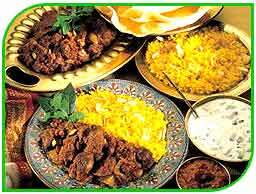 If you are having Indian have different dishes like Korma, Vindaloo and Tandoori and rice, naan bread, etc even mix up a nice mint/yoghurt side dish or a tomato and onion Salas or mango chutney. Pretend that you are a restaurant and that you are doing a banquet style meal. (all of these are easy by the way, packet or bottled sauces, go to the supermarket and just use the prepared sauces you just add meat n veg). And try something new, get a recipe and just do it, just for kicks or for the fun. The more I learn from other people the better my cooking becomes. Because I take their ideas, mix them up and create new and exciting things to eat. Extra credit: You’re ten and allowed to cook a meal. What do you cook? I was in Cub Scouts and one of the badges we had to do was cooking. I cooked the family meal complete with dessert one night to earn me that badge – I must have been around 10 (if not younger). So what did I cook? Starters was toasted cheese fingers, grilled to perfection! For dessert I got a large serving of ice cream and poured chocolate sauce all over it! YUM!!! Great tip! Thanks! And thanks for stopping by my blog. I’ll vouch for Dr. D’s cooking. I’m the pickiest eater ever and his main courses are so free form that I can always find a yummy combo that allows me to eat my fill.